By utilizing and expanding negative view of those within the brewing industry, advocates of the Prohibition, were able to convince Americans that those within the industry were unpatriotic foreigners who encouraged drunkenness, and would destroy societal values. By the 1900s beer consumption, along with other alcohol consumption, had increased significantly, making brewing a highly profitable industry. Part of this sharp increase was caused by the large amounts of immigration from countries that reflected a strong drinking culture such as Britain, Germany, and Ireland. Prosperous after introducing a more Bavarian type lager to America, brewers (especially the Germans), experienced immense prosperity during the time period leading up to prohibition. It was noted that during the immediate years leading up to prohibition there were more than 1200 German-owned breweries in the country. At the forefront of these successes was the brewing company Anheuser-Busch. Lead by the German immigrant Adolphus Busch, the Anheuser-Busch brewery possessed immense capital which was used for extensive lobbying against prohibition within the United States government. Popular campaigns such as the advertisement of beer as "liquid bread" were generally successful, and Busch and the brewing community were able to fight off early national prohibition legislature, but in the end they ultimately failed, and legislature was enacted. The success of the proponents of prohibition and the failure of the brewing industry was due to the fact that supporters of the prohibition shamelessly targeted brewers based on their ethnicity. Contributing to this sentiment was the ongoing war against Germany as well as negative view of their cultures, especially the perceived uncontrollable drinking habits. Groups such as the Anti-Saloon League portrayed the brewers as "unpatriotic" foreigners who endangered the structure of American society, and helped defeat the attempts of those in the brewing industry to stop with movement to stop the Prohibition from happening. Adolphus Busch who was at the forefront of production in the beer industry. 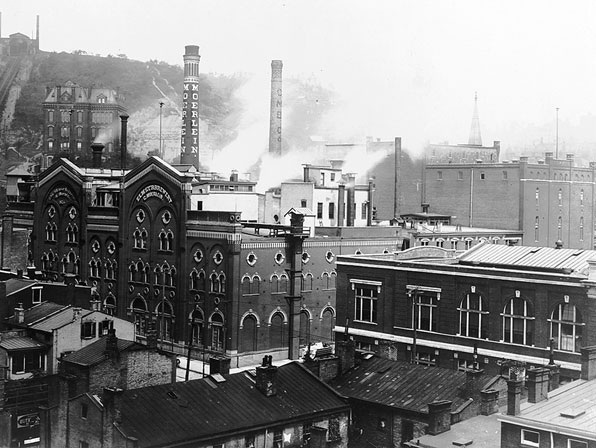 Historic Christian Moerlein Brewery located in Cincinnati. After the Prohibition they did not go back into business.